Combine the beauty of old world craftsmanship with today's Technology. Landscape Lighting, a specific type of outdoor lighting using low voltage lighting fixtures, is both an art and a science. 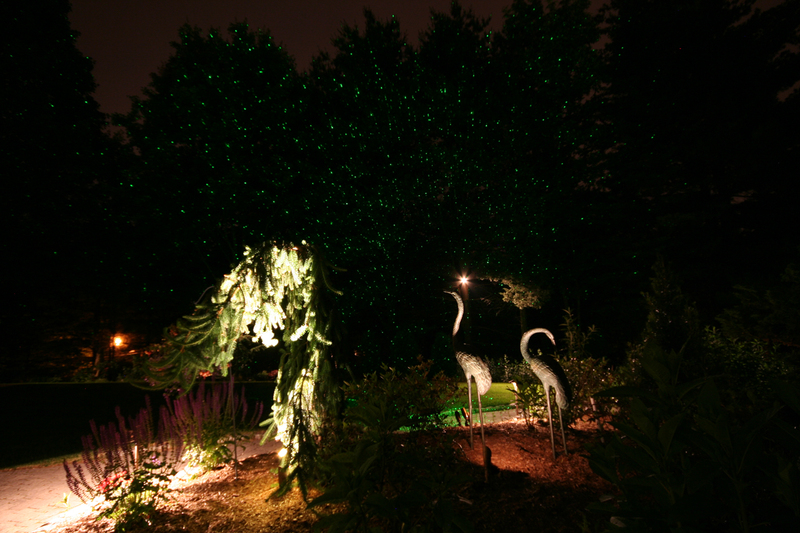 It is a profession born out of the marriage between lighting design and landscape design. 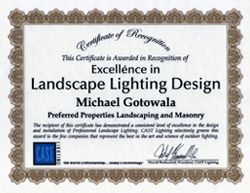 For this reason, many of the most talented landscape lighting designers are also landscape professionals. Such is the case with Michael Gotowala, President of Preferred Properties Landscaping and Masonry (based in Cheshire, CT). We feature Michael here (our first installment in a series) because his lighting talent is so exceptional. 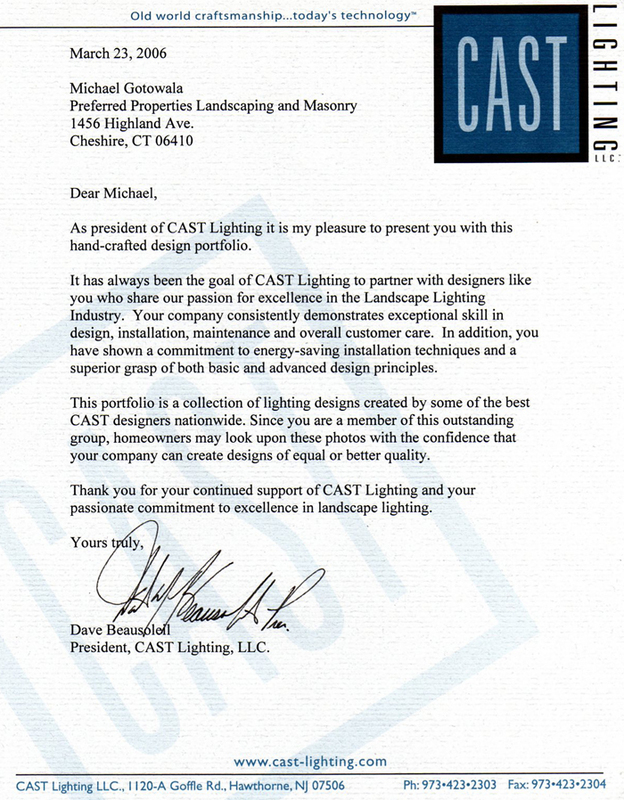 Click here to read more about CAST Landscape lighting with Michael Gotowala of Preferred Properties Landscaping and Masonry. 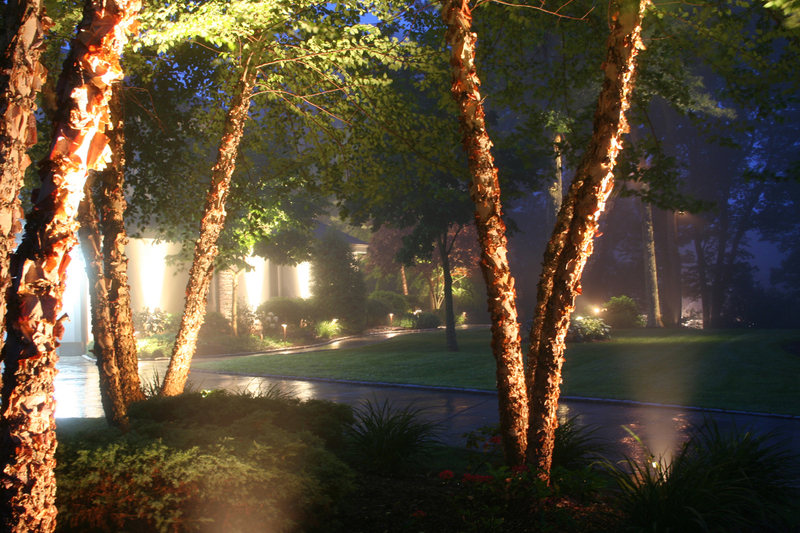 Preferred Properties Landscape lighting designer Michael Gotowala shows us an incredible night lighting scene that distinguishes the best from the rest. A true lighting designed to illuminate all the elements at hand and draw attention to selected focals surrounding the pool. Various elements draw complexity due to the location of the fixture as well as the installation procedure. The color, contrast, and beam spray of each luminaire in coordination with all other luminaires directed at certain elements in the field bring together the lighting design. Read More. 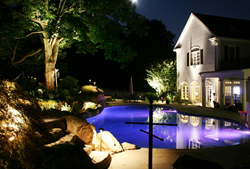 Preferred Properties Landscaping is one of Connecticut's Premier lighting design and installation firms. 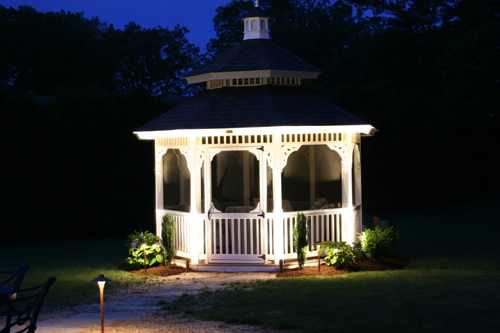 Our company designs and services outdoor low voltage lighting in many of the surrounding towns including Farmington, Avon, Glastonbury, Simsbury, Cheshire, Southington, Woodbridge, Niantic, Orange and Southbury. 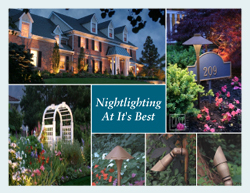 Outdoor lighting properly designed provides beauty, usefulness, safety, security and emotion. With the correct outdoor lighting automation, low voltage outdoor lighting can be versatile and useful in many commercial areas too. You can add outdoor landscape lighting to a seniors community, play ground or park, office complex, condo complexes and so much more. Give the bride a gift of a night time! Preferred Properties Landscape lighting is licensed and knowledgeable for creating that special event of a night time. 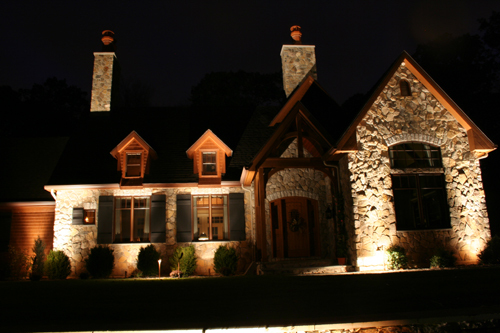 Learn more about our night-time demonstration below and discover why you should light your home with a licensed landscape lighting designer instead of an electrician? Secure your home from the unknown. There is nothing better than arriving home late from work with the lights totally illuminated as you pull into your residence. With controlscape automation, numerous scenes can be at the touch of a fingertip. i.e. Your night lights go off at 10:00 pm and at 10:01 pm your motion detectors are set. You can even automate the outdoor lighting with video. The stars are the limit. Second feature is the capability of video monitoring. For a reasonable price home surveillance can be an emotional relief. Video monitoring and capture recording is now available for a modest price. Technology is awesome. You can now go as far as watching your home and premise on the internet from anywhere..
One can see out into the yard quite easily anytime of night. It is good too if you have pets and animals that you may want to keep an eye on. The attributes on night lighting offer beauty, usefullness, safety, security and emotion. Safety and security are important when you don't expect it. Preparation is key. Covering the outside deters intruders and watchers from your home. Live on a dark street? Night lighting could be the answer. 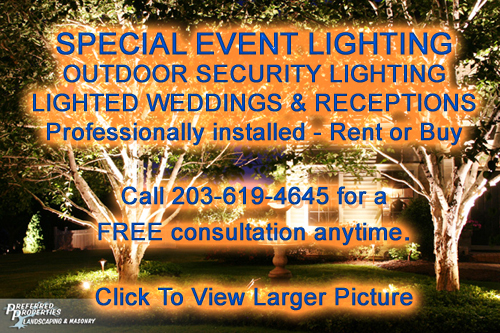 A sound night lighting design will work with anyone of the security professionals you choose. Say for instance your outdoor lighting goes on from 20 minutes before sunset til 11:30 pm. You should have your motion detectors set on a timer to go on at 11:31 pm. This way here if anyone enters the drive the motion lights detect and illuminate. Sounds suspicious grab your remote and activate the nightlighting surround in the trees. Nightlighting helps in numerous ways. Intruders will select areas of darkness to stage and enter. If your landscape is nicely lit, it would be probable they may go somewhere else. Opt for a free night time evaluation and discover the possibilities of just how safe and secure your home can be. Implement a night lighting scene to cover the aesthetics and usefulness of the property. Night lighting brings awareness to the areas that disappear into the night. What happens next. The outlets that the outdoor transformers are plugged into are intercepted and brought back to the security module interface. Now these can be programmed as accessories to your home security. Bravo, you get it.. Not that hard. Something to realize are you need to have planning and preparation by both home security automation and outdoor lighting professionals. This is where we as outdoor lighting professionals, licensed by the State of Ct. and certified to work with low voltage wiring is important. A landscape designer who is licensed for low voltage is an ideal candidate to bring out the best of your night lighting scene. Electricians are more technical and we need them for the final engineering and installation. But electricians don't really portray the best visions when it comes to understanding the landscape and how it should appear lit at night. Go onto www.Nightlightingdesigner.com to see our efforts. Connect us to your home security professional of choice and we will do the rest. You can correlate low voltage lighting to the head lamps in your car. These head lamps are running on 12 volt and you can easily see a quarter mile down the road. When your exterior home landscape lighting is correctly engineered, you will have equal brightness throughout the various parts of the garden. 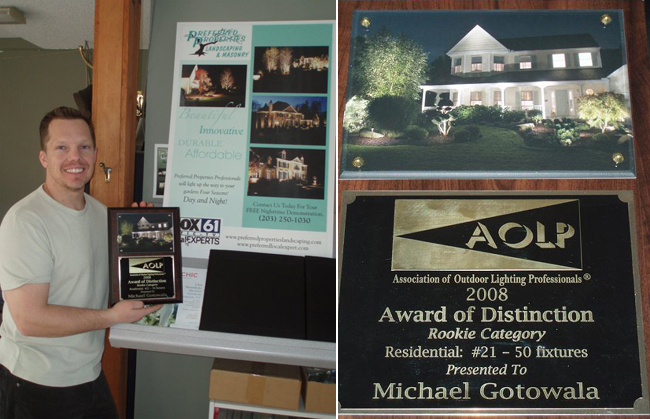 Preferred Properties Landscape Lighting professionals have had the privilege of being the 2008 AOLP recipient of the residential award of Distinction. Live in Connecticut? New York? You have everything to gain by contacting us today. Look at our efforts online by visiting www.Litesatnight.printroom.com. Call to talk to a specialist or enroll online for a free night time demonstration. Are you still in the dark with your landscaping? Click video above to view. 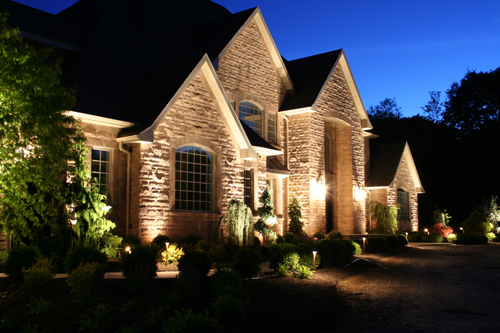 Let a Preferred Properties Landscape Lighting professional demonstrate just how good your home looks at night. Preferred Properties Landscaping uses only the best fixtures on the market. 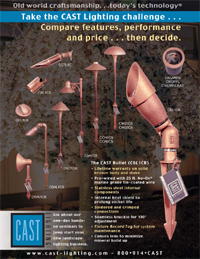 Solid bronze, copper stems and a lifetime guarantee. Properly designed and engineered, Landscape lighting is most indeed one of your best value driven home improvement projects ever. Just think each fixture unlike line voltage can move 15 ft. in either direction as your landscape grows. Thus keeping the integrity of the lighting design. Two types of maintenance are required for the lighting. Electrical and aesthetic maintenance. Preferred Properties has the ability to do both. Our horticultural experience and electrical licensing has made us a residential favorite. Start receiving the benefits today. Have you had lighting in the past? Are you satisfied with the lighting currently working? These are just two of the questions that any contractor should ask. Being one of the very first horticultural professionals with an electrical L-5 low voltage license has made our designs stand out amongst the rest. We understand the landscape and know how the greenscape and hardscape should interact among one another in the night, Areas you are familiar with during the day disappear into the night. Preferred Properties Landscaping has the experience and vision to show you how these elements should appear lit. The night time scenes we have created all start with a demo. This allows the homeowner to interact with darkness and by being present comprehends that a professional landscape designer with lighting talents is far better off than an electrical technical lighting contractor. 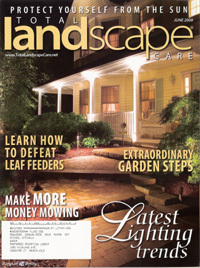 Preferred Properties Landscaping and lighting has had their lighting jobs on the front cover of TOTAL LANDSCAPE CARE Magazine, Center of RESIDENT Magazine in Minnesota, Featured in Connecticut Home and Garden, Seen on BETTER CT. Channel 3, featured on Fox 61 and even on page 27 of the CAST-Lighting.com manufacturers book. We are authorized contractors for Controlscape automation. 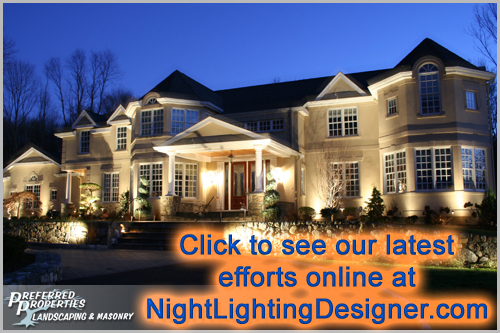 We have our pictures on the AOLP - Association of Outdoor lighting Professionals home page. And the best achievement yet to be the 2008 Residential award of Distinction handed out in Arizona. We are proud to bring that better to a Connecticut resident. 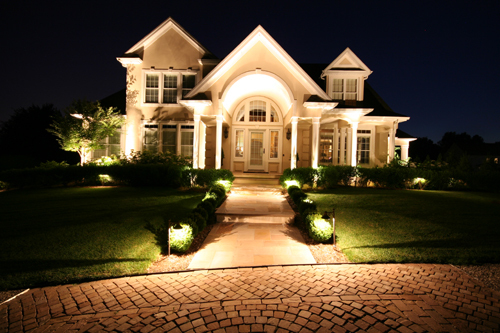 When night lighting is perfected on the premises, the inside of the home becomes connected to the exterior attributes of the home. This feeling of extension brings tremendous enjoyment to the family. The benefits of pleasure, beauty, usefulness, safety, security and more time at home over the next 10-20 years far surpass the cost when comparing DIY to DIR-Doing It Right. 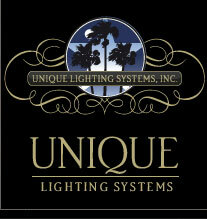 The first step is to contact a lighting specialist--one who understands the plant materials and hardscapes at hand. A landscape design lighter understands the illuminance composition necessary to bring the lighting to its fullest beauty. This may mean bringing in plant materials, sculptures or focal pieces to complete the lighted scene. An electrician offers strengths and technical know-how, but falls short when it comes to this type of landscape lighting portrait. 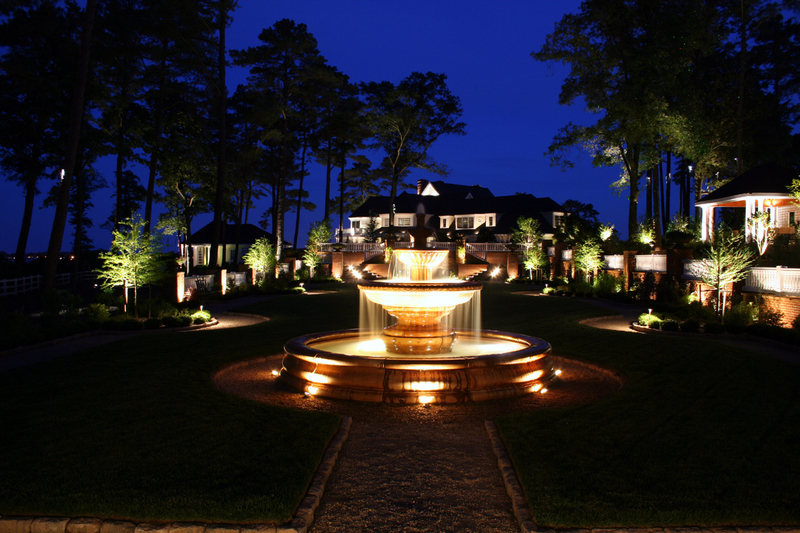 Landscape lighting does not play a role in the technical aspect. 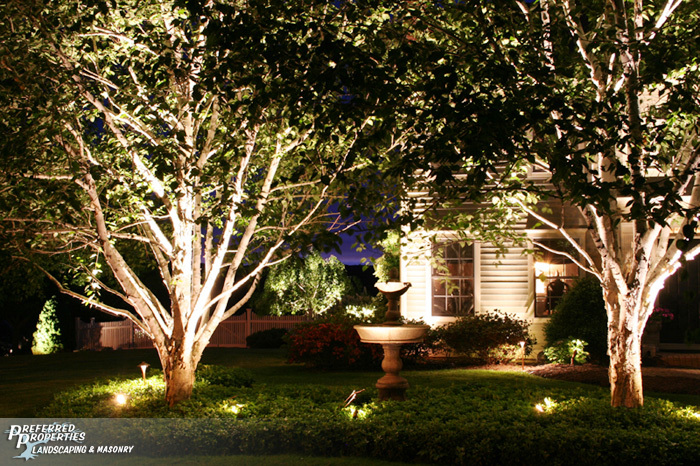 Outdoor landscape lighting is an aesthetic art form. The lighting demo has many attributes and is a necessity for lighting perfection. Preferred Properties staff visit the site, walk the grounds with the homeowner, discuss lighting strategies, fixture types and themes. With automation, many themes cane be demonstrated. Preferred properties designer Michael Gotowala captures the litesatnight at Baywood Greens. Click photo above to see larger image or here for additional photos of Preferred's work at Baywood Greens. Preferred Properties Landscaping puts final touches on Delaware project! Helping to light up the country club. For all you golfers this is it. Click photo or here for pictures of Preferred's work at Baywood Greens. There are many lighting rules which apply to the conceptual plan. Smaller parcels diminish light glare and pollution for the neighbors. Overuse of horizontal fixture types creates a landing strip appearance. The lighting design should have no dark holes. There should be lighting connectivity and composition throughout the design. Equal brightness of focal points surrounding architectural elements needs to be considered. Brightness levels need to be illuminated with connecting lower levels of illumination. The points of view need to be identified. Imagine seeing 100,000 stars glittering over your back yard. New technology brings you a laser light show in your own backyard! These, and other lighting conceptual concerns, are presented and discussed individually in an effort to establish a master lighting plan for the property. This lighting plan can be implemented in phases do to budget, time constraints, and desires of the homeowner. 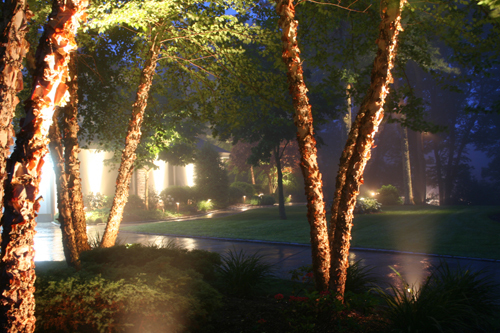 The landscape lighting master plan brings the landscape plan to the fullest 8 seasons, 4 seasons both day and night. This can best be seen by viewing the night lighting demo, which is tailored specifically to the site. The demo is wired and programmed to be on--the homeowner is now able to go outside and see it for the first time. A walk-around fine-tunes the project. Photos are taken and digital prints are uploaded to the internet. Accurate beam spray and intensity can be honed in by the picture on the internet. Equal illuminance can be compared. Please visit www.litesatnight.printroom.com to see our efforts and night lighting photos. For the most part, the demo is the initial phase of lighting, with fixtures added, eliminated, or moved to a greater strategic area. Flags can hold the spot for new fixtures, and by writing on the flag, the fixture type can be followed. After a binding contract is reached, our crews begin the installation process. The lighting job is now in the pre-buried state. Another walk-through at dusk will ensure that all fixtures are properly located and pointing to the right spot. The homeowner now needs to sign off on the completion approval, and crews return to finish the installation. The final evening, more pictures are taken and subtle adjustments are performed. Preferred Properties Landscaping checks for any adjustments necessary to the landscape; clean up is done, and lighting automation is discussed. 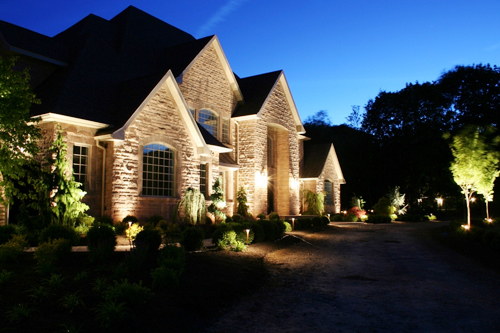 There are many ways to control the landscape lighting. This lighting automation will be addressed later. An as-built plan is presented showing all structures, trees, flower beds and electrical requirements relevant to the design. The plan also shows all landscape lighting fixture locations by type and wattage, and are numbered for easy identification.